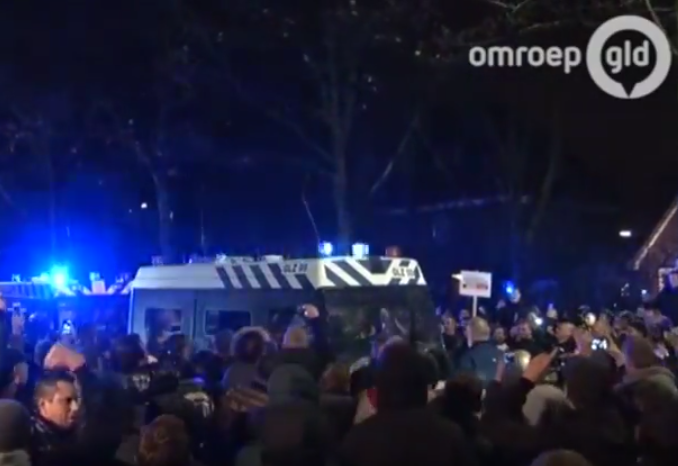 The majority of people involved in Wednesday night’s riots in Geldermalsen came from the Gelderland town itself, police said on Thursday. In addition, all 14 people arrested for their role in the disturbances, during which a mob tried to smash their way into the town hall, were local, police chief Rob Nieuwert said. Police fired warning shots and riot police carried out charges in an effort to restore order after a demonstration against plans to build a refugee centre to house 1,500 people turned ugly. Between 70 and 80 people were involved in tearing down fences and pelting the building with bricks and fireworks. The council meeting was abandoned. Nieuwert said he had been shocked by the attacks. ‘Three police officers felt the situation was so serious that they drew their weapons. Two of them fired warning shots into the air and in my initial opinion this was completely justified,’ he said. The attack appeared to have been coordinated, he told a news conference. Geldermalsen and its surrounding villages has a population of some 15,000. The plan to build the refugee centre on unused industrial land next to the A15 motorway would remove a €12.5m financial headache, the NRC pointed out. The town paid a local farmer for the land and invested heavily in making it ready for industry but as yet there have been no takers. If it goes ahead, the Geldermalsen refugee centre would be the third biggest in the country behind Ter Apel in Groningen (1,850) and Budel-Cranendonck, some 25 kilometres from Eindhoven (1,750).